Universities are supposed to be safe places to debate controversial ideas but school administrators and students leaders would sometimes prefer instead to enforce their own points of view, even if it means silencing others. As a result, the limits of free speech are frequently debated on campus. This week it’s at the University of Manitoba where a pro-life group is showing photos comparing abortion to the Holocaust and Rwandan genocide. Student Ashley James told the Winnipeg Free Press that it’s preventing her from focusing at school. Make what you will of that conclusion, the index offers a good summary of the tension on campus. The most common limits on free speech cited in the report were those placed on anti-abortion groups by student unions. The report quotes the Trent Central Students Association’s strange explanation for rejecting a pro-life club: “Campaigning for pro life or pro choice [sic] is not allowed on campus… since there is [sic] so many opinions to this it can lead to a very exclusive group, while all groups at Trent must be inclusive.” It also quotes the Brandon University Students’ Union which said it wouldn’t certify a pro-life group because, “[it] would be redundant since the Women’s Collective deals with all gender issues.” Student unions also hindered pro-life groups at York, Memorial, Calgary, Guelph and Lakehead, to name a few. On the other hand, the University of British Columbia administration got an “A” after it lifted restrictions on the pro-life club Lifeline. A newcomer to the free speech debate is “men’s issues” after the University of Toronto Students’ Union and the Ryerson Students’ Union both outlawed men’s issues awareness clubs this year. The UTSU claimed such groups “harass women.” The RSU called one a “hate group.” The University of Toronto’s administration, however, was the only one to receive an “A” for its policies, which helped maintain relative calm when a men’s issues group hosted an anti-feminist lecture. Another perennial issue is the Arab-Israeli conflict. The University of Manitoba Students’ Union got an “F” this year after removing official status from Students Against Israeli Apartheid, which they said discriminated against “zionists.” Wilfrid Laurier University’s administration also got an “F” after removing what they saw as offensive Israeli Apartheid Week posters. McGill University’s student union was failed for forcing an Israeli student club to change the name of an event. 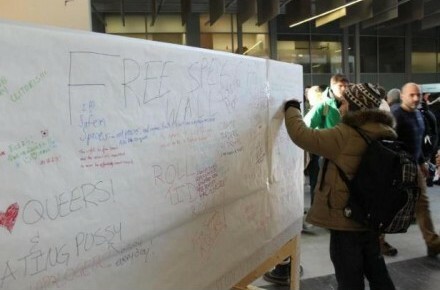 Among the universities to get an “F” was Queen’s, whose administration made national news after they sanctioned tearing down a paper “free speech wall” because it contained “offensive content.” It turns out that wall was sponsored by JCCF so don’t be surprised if it’s tacked up once more.